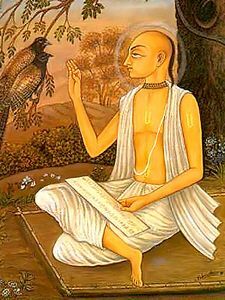 Raghunatha Bhatta Goswami (1505-1579) is one of the six Goswamis of Vrindavana, leading disciples of Chaitanya Mahaprabhu. Raghunatha Bhatta's father, Tapana Mishra, was also a prominent follower of Lord Chaitanya. Chaitanya Mahaprabhu asked Raghunath Bhatta to go to Vrindavan and constantly chant the Hare Krishna mantra and read Srimad-Bhagavatam. Every day, Raghunath Bhatta would sing the verses of the Bhagavatam to the Vrindavan residents, and his tears of spiritual emotion would wet the pages of the Bhagavatam as he sang. Raghunatha Bhatta Goswami never criticized anyone. He believed that all Vaishnavas are sincerely serving Krishna according to their realization and therefore one should overlook their faults. Under his inspiration, a wealthy disciple built the temple for the Radha-Govinda Deities in Vrindavan.